Pneumothorax is the collection of air or gas in the space inside the chest around the lungs, which leads to a lung collapse. 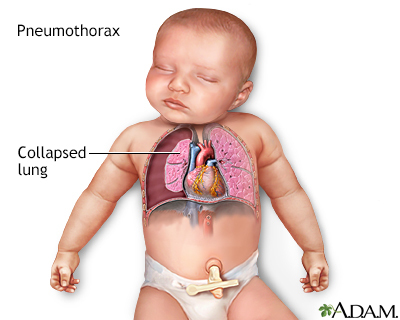 A pneumothorax occurs when some of the tiny air sacs (alveoli) in a baby's lung become overinflated and burst. This causes air to leak into the space between the lung and chest wall (pleural space). The most common cause of pneumothorax is respiratory distress syndrome. This is a condition that occurs in babies who are born too early (premature). The baby's lungs lack the slippery substance (surfactant) that helps them stay open (inflated). Therefore, the tiny air sacs are not able to expand as easily. If the baby needs a breathing machine (mechanical ventilator), extra pressure on the baby's lungs, from the machine can sometimes burst the air sacs. Meconium aspiration syndrome is another cause of pneumothorax in newborns. Before or during birth, the baby may breathe in the first bowel movement, called meconium. This may obstruct the airways and cause breathing problems. If the baby needs a breathing machine (mechanical ventilator), extra pressure on the baby's lungs from the machine can sometimes burst the air sacs. Other causes include pneumonia (infection of the lung) or underdeveloped lung tissue. Less commonly, an otherwise healthy infant can develop an air leak when he or she takes the first few breaths after birth. This occurs because of the pressure needed to expand the lungs for the first time. There may be genetic factors which lead to this problem. The health care provider may have difficulty hearing breath sounds when listening to the infant's lungs with a stethoscope. The heart or lung sounds may seem as if they are coming from a different part of the chest than is normal. Babies without symptoms may not need treatment. The health care team will monitor your baby's breathing, heart rate, oxygen level, and skin color. Supplemental oxygen will be provided if needed. If your baby is having symptoms, the provider will place a needle or thin tube called a catheter into the baby's chest to remove the air that has leaked into the chest space. Since treatment will also depend on the lung issues that led to the pneumothorax, it may last for days to weeks. Some air leaks will go away within a few days without treatment. Infants who have the air removed with a needle or catheter often do well after treatment if there are no other lung problems. As air builds up in the chest, it can push the heart toward the other side of the chest. This puts pressure on both the lung that hasn't collapsed and the heart. This condition is called tension pneumothorax. It is a medical emergency. A pneumothorax is often discovered shortly after birth. Call your provider if your infant has symptoms of pneumothorax. The providers in the newborn intensive care unit (NICU) should watch your infant carefully for signs of an air leak.